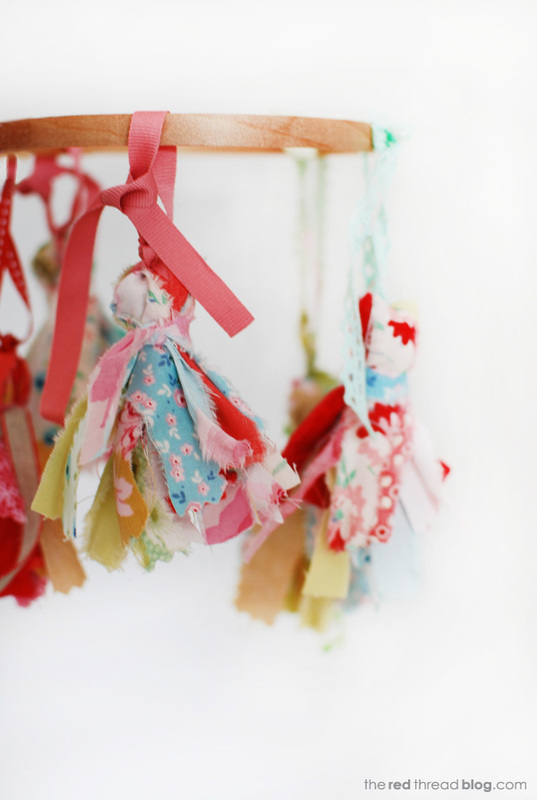 Fabric scrap tassels are fast and easy – all you’ll need is fabric, scissors and twine or ribbon. You can use any fabrics including bargain bin finds, thrifted linens, and scraps from your sewing stash. Start by cutting the fabric into pieces that are about 20 cm (8 inches) wide x whatever length you have. This size will make tassels that are about 10 cm (4 inches) long. Along the long edge of the fabric make small cuts three centimetres (about an inch) long and two centimetres (three quarters of an inch) apart. Then, with the cuts to start you off, tear the fabric into strips. Keep the different fabric strips grouped. Now gather up strips to make a tassel – you’ll need about 14 strips for each one. Design your tassels using a mix of all the fabrics or make them using a selection of colours. Lay out the strips in a group with the printed side facing up them move them around so there is a pleasing combination of colours and patterns on the top of the pile. Take a piece of ribbon or twine and tie it around the centre of the tassel with a double knot. Fold the fabric strips in half over the ribbon. Then take another fabric strip and tie it around the tassel, about two centimetres (three quarters of an inch) from the fold. Tie a double knot and flatten the ends of the tie down so they merge with the tassel. And that’s it, tassel made. So easy, right? Play around with colour and pattern combinations and have fun making and using them. This tutorial first appeared here on decor8 on 18 September in my regular craft column: make me. 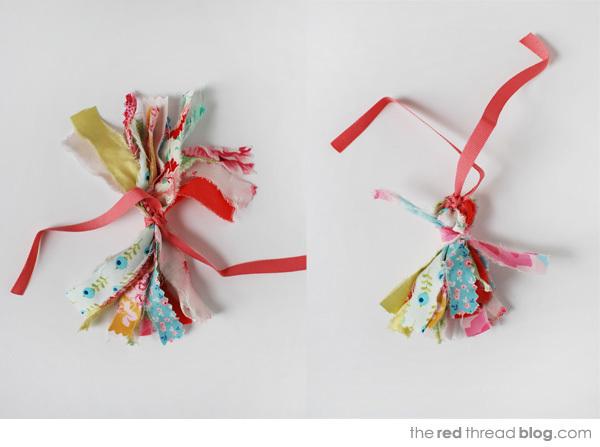 If you like this scrap fabric tassel tutorial you might also enjoy seeing my previous tutorial on how to make and style yarn tassels, or the big rag rope tassels I made.